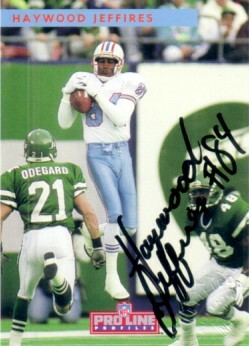 1992 Pro Line Profiles certified autograph card of former Houston Oilers Pro Bowl receiver Haywood Jeffires. Embossed with the NFL seal of authenticity. ONLY ONE OF THIS CARD AVAILABLE FOR SALE.